Join your fellow elves in an exciting journey to the human realm. 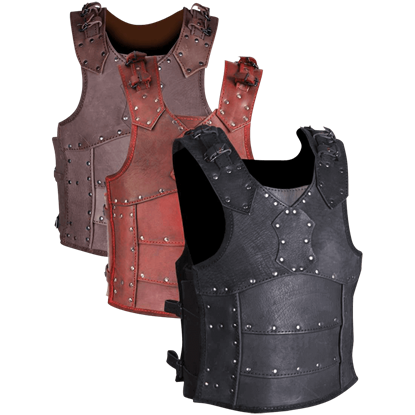 Be prepared for a grand adventure and the wealth of unforgettable tales found only on the LARP battlefield with the Assassins Leather Helmet shielding your brow. This enclosed helmet covers the entire face. Wide eye cutouts and a shaped pointed nose ensure an excellent field of vision. Layers of leather bands form a Mohawk over the brow and crown of its wearer. A hexagonal patch rests between the eyebrows. Stitching reinforces the structure and design of the helm. 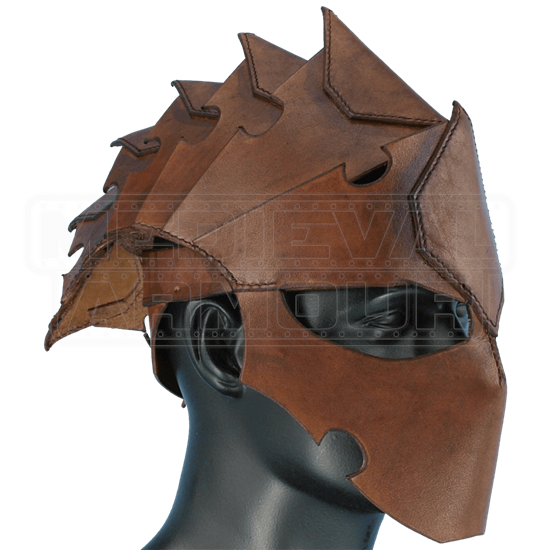 The Assassins Leather Helmet is made to fit over the head. A leather brace with cording provides closure in the back. Medium: Fits a 20 Inch Circumference. Back of helmet laces up to provide a custom fit. Large: Fits a 23 Inch Circumference. Back of helmet laces up to provide a custom fit. Great service and fast delivery! Item was what I expected it to be and I was not Diapointed. 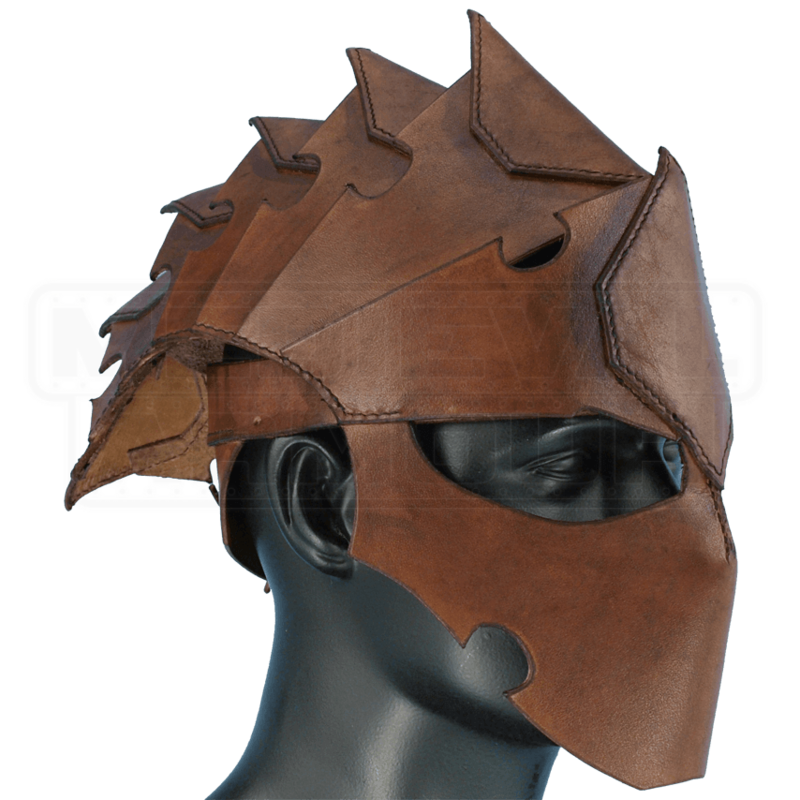 I love this helmet, It is solidly made. The only thing that I had to drop a star from was that there was so much excess dye in the front mask part that it was leeching really heavily onto my face. To solve the problem I just treated the inside of the helmet with a good amount of paraffin wax and it not only helped the dye-leech issue, but also stiffened up the mask portion considerably. Great product! Kids will be kids, and despite your attempts to keep them safe, they will do dangerous things, like go to war or slay dragons. 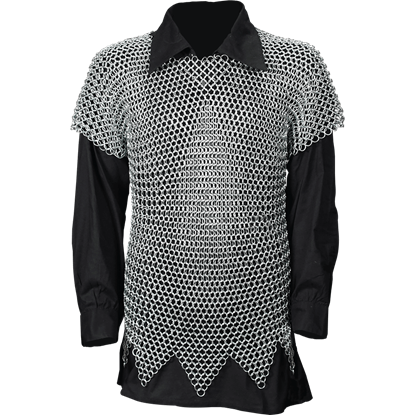 You may as well make sure they are protected by equipping them with the Kids Butted Chainmail Shirt.